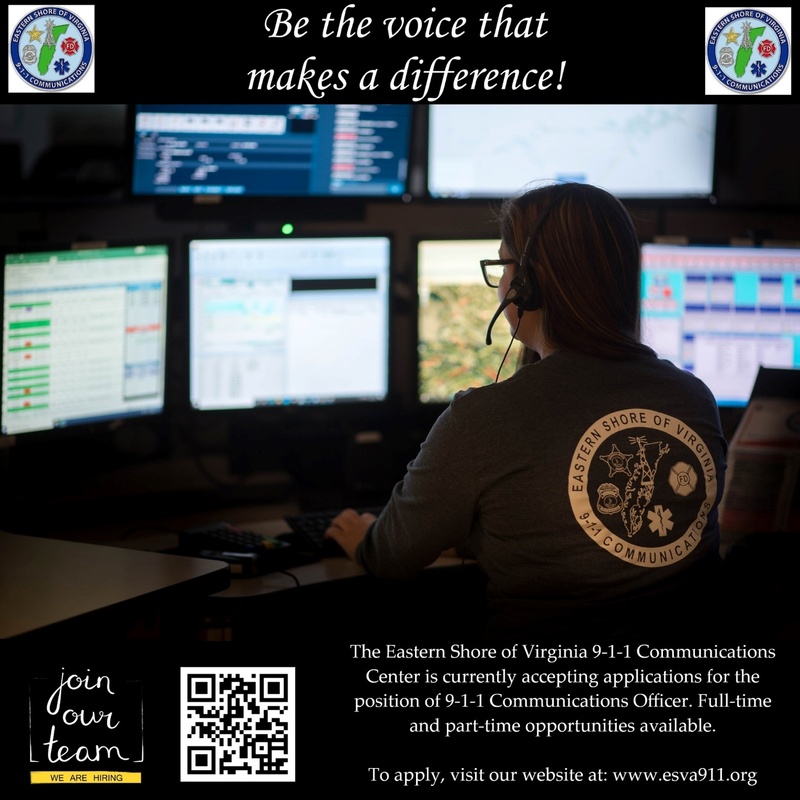 The Eastern Shore of Virginia 9-1-1 Commission is now accepting applications for 9-1-1 Communications Officers for immediate part-time openings, with a focus on individuals potentially interested in future full-time advancement. The qualified applicant will work rotating shifts, including weekdays, weekends, and holidays, as well as fill in shifts as needed. Communications Officers are responsible for answering 9-1-1 calls, verifying the callback number and address of the emergency, determining the nature of the emergency and transferring the call or dispatching the appropriate emergency response unit as required, as well as other associated duties. Minimum qualifications are a high school diploma or equivalent, including some experience in keyboarding or typing. Applicants must be able to speak clearly and distinctly, understand and follow detailed directions, act quickly and effectively during emergencies, and operate complex telecommunications equipment. Desirable qualifications include two years experience in law enforcement, fire, or emergency medical services, and/or public safety dispatching. Applicants selected for employment will be subject to a background investigation and drug screening. Applications may be obtained at the Eastern Shore of Virginia 9-1-1 Communications Center, 23201 Front St., P.O. Box 337, Accomac, Va. 23301 or by downloading here. Applications are due by 3 p.m., April 12th, 2019. The ESVA 9-1-1 Commission is an equal opportunity employer. 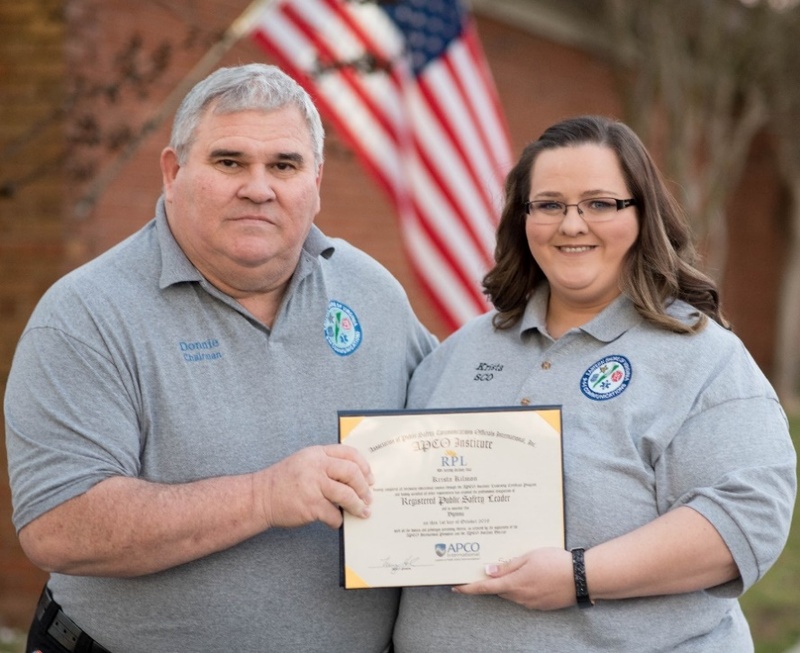 The Virginia Chapter of the Association of Public-Safety Communications Officials – International, Inc., awarded the Commonwealth’s 2017 Line Supervisor of the Year award to Crystal Simpson, the Eastern Shore’s 9-1-1 Supervisor, at the NENA-APCO Spring Conference held in Virginia Beach on May 10. Presenting the award is Gabe Elias, Chapter President. Crystal was recognized for her outstanding dedication and commitment to 9-1-1 Center operations. 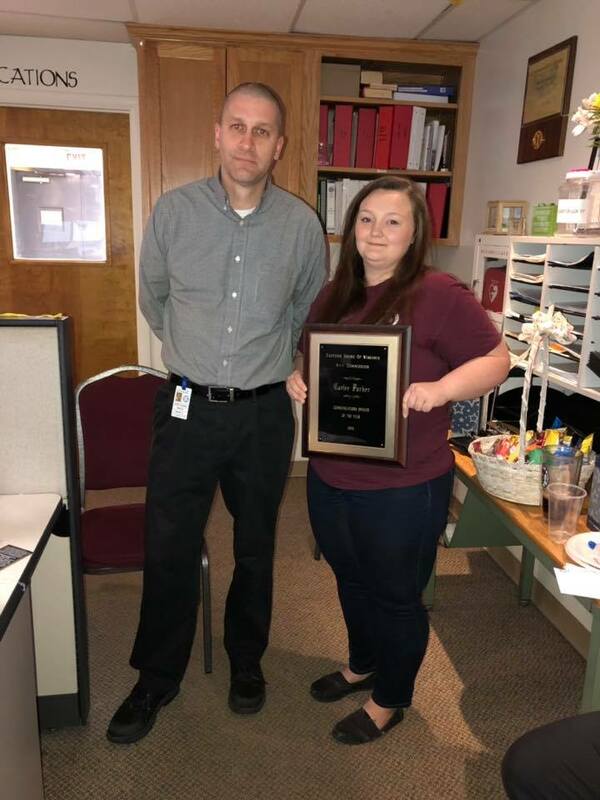 She finds ways to make the workplace a better environment, including stepping up to help cover the dispatch floor when needed, listening to those she supervises whether it be a personal matter or an idea to improve dispatch floor operations, and overall being present and supportive for the staff of the 9-1-1 Center. On Wednesday April 11, 2018, during National Telecommunicators Week, Communications Officer Randy Green (pictured right) was recognized as the 2017 9-1-1 Communications Officer of the Year by Director Jeff Flournoy. Beginning his tenure with the ESVA 9-1-1 Center in 2016, Randy has become a proficient 9-1-1 Communications Officer serving the Eastern Shore of Virginia. Randy showed his dedication to the job and to those he serves (whether the public or our brothers/sisters in the field) from his first day at the ESVA 9-1-1 Center. This was shown by his willingness to devote the needed time and effort to learn his job and its responsibilities. Randy has developed a deep and solid working knowledge of the Fire/EMS dispatch policies and procedures, as well as policies/procedures related to other operations and is flexible to assure the needs of the 9-1-1 Center are met. Thank you, Randy, for your dedication to our Eastern Shore and Congratulations; well-deserved recognition! 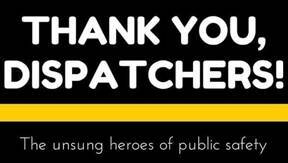 Thanks to all our Communications Officers for their dedication and service throughout the year. On August 1st, 2017, a Resolution of Appreciation was presented to William “Bill” Mariner for his years of service on the Eastern Shore of Virginia 9-1-1 Commission. Bill was a charter member of the 9-1-1 Commission, serving since its inception in 1990 until his recent passing on August 6th, 2017, just several days after the Resolution was presented. For twenty-seven years, Bill, as a member of the Greenbackville Volunteer Fire Department, represented Accomack County EMS on the 9-1-1 Commission. The picture on the right, from the presentation on August 1st, includes (from left to right), Jeffrey Flournoy (Director for the 9-1-1 Center), Donald Kellam (Chairman of the 9-1-1 Commission), Scott Chandler (Consultant for the 9-1-1 Center), and Ben Byrd (9-1-1 Commissioner), with Bill Mariner seated, holding the Resolution. The Eastern Shore of Virginia 9-1-1 Commission recently installed and upgraded its telephone call handling equipment (CHE) to facilitate the handling and processing of emergency calls for the Eastern Shore of Virginia 9-1-1 Center. The new equipment and software, known as Emergency CallWorks, was provided by Motorola Solutions. Emergency CallWorks’ solution provides an advanced, next-generation version of 9-1-1 that is capable of moving beyond voice-only calls by processing multimedia information into the call flow. Its browser-based workstation architecture eliminates proprietary 9-1-1 switching hardware, simplifies operations and provides cost-effective system implementation, allowing for remote monitoring, service and support, with continuous delivery of innovative new features. The system provides additional integrated mapping features to improve call handling by communications officers. Additionally, new telephones utilizing voice over internet protocol (VoIP) were installed to support Emergency Operations Center functions. That system is provided and supported by Eastern Shore communications, a local internet and telephone vendor located in Cape Charles. The Eastern Shore of Virginia 9-1-1 Commission recently sought proposals from vendors to provide, deliver, install, and integrate new telephone call handling equipment (CHE) to facilitate the handling and processing of emergency calls for the Eastern Shore of Virginia 9-1-1 Center. Center staff visited other sites, hosted demonstrations, and evaluated proposals prior to recommending the successful vendor and product to the Commission. The new equipment and software, known as Emergency CallWorks, will be provided by Motorola Solutions, and will be installed this summer. Chairman Donald Kellam and Director Jeffrey Flournoy execute contract with Motorola’s representative, Neil Kunzler. The Eastern Shore of Virginia 9-1-1 Commission placed a simulcast radio system for F1 (Rescue Dispatch) in operation during June 2015. The system allows transmitters at multiple sites to be keyed simultaneously to deliver dispatch traffic shore-wide. Previously, three separate transmitters were used based on the geographic location of the call. When simulcasted, dispatches and radio messages cover all areas; incidents in multiple geographic areas do not have to be replicated. Additionally, the Commission deployed a simulcast EMS operations channel that moves EMS radio transmissions from the dispatch channel during July 2015. The EMS Operations channel utilizes multiple repeaters to broadcast 9-1-1 radio traffic and rebroadcast field communications shore-wide. As the EMS Operations channel was readied for operations, field radios were reprogrammed. Atlantic Communications was awarded the contract to provide, deliver, install, and integrate the new simulcast dispatch radio system and perform related tasks. On Monday, November 18, 2013, the Eastern Shore of Virginia 9-1-1 Communications Center transitioned and began receiving 9-1-1 calls that were previously routed to and processed by the Town of Chincoteague. The Eastern Shore 9-1-1 Center will transfer any police related calls to the Chincoteague Police Department for dispatch, but will directly dispatch fire and EMS calls to the Chincoteague Volunteer Fire Company (Station 3). On October 21, 2013, Chincoteague Town Council voted to transition Chincoteague’s 9-1-1 services and the dispatch of Station 3 to the ESVA 9-1-1 Center. The last several weeks have included planning for the transition and the development of an agreement between the Town of Chincoteague and the ESVA 9-1-1 Commission.